Lucas Punkari/Daily Herald Northern Ontario second Max Cull and lead Maxime Blais let skip Tanner Horgan how the shot of third Jacob Horgan is going at the Art Hauser Centre Saturday morning. 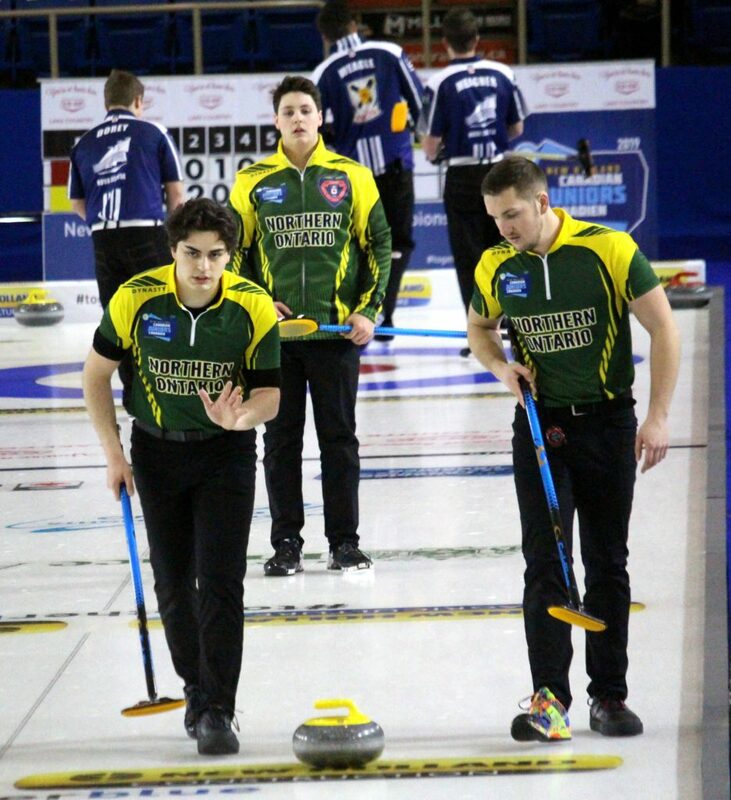 The ebbs and flow of a curling match were easy to see if you watched Northern Ontario skip Tanner Horgan during the opening draw of the 2019 New Holland Canadian Junior Curling Championship at the Art Hauser Centre Saturday morning. Visibly frustrated after giving up a steal of two points in the ninth end, the two-time national men’s runner-up bounced back by picking up two points of his own in the tenth end to pick up a 7-6 win over Nova Scotia’s Graeme Weagle. “We were playing well enough as a team to control the game, but then we started to get really sloppy late,” Horgan said. The Sudbury product, who is competing in his sixth nationals, blasted through a crowded house on his first shot attempt to sit one and then came around a couple of guards on a quiet hit attempt on his final stone to seal the victory. “(Fourth stone thrower Owen Purcell) overcurled a little bit on his guard attempt, which left me a chance to throw peel weight through the hole that was left there to get at all of those rocks around the button,” Horgan recalled. Although they didn’t get the win, it was still a strong start for Weagle’s Nova Scotia rink, as they are competing in their first juniors after capturing the Under-18 boys’ national title in 2018. “It feels nice to be able to compete against such a good team in our first game here,” Weagle said. Two-time defending national men’s champion Tyler Tardi and his British Columbia quartet got off to a strong start with a 10-2 win over the Yukon’s Trygg Jensen in eight ends. The other men’s games saw Alberta’s Desmond Young pick up an 8-6 victory over Greg Blyde of Newfoundland and Labrador, while Manitoba’s J.T. Ryan doubled up Quebec’s Vincent Roberge by a score of 6-3. Saturday morning’s lone game in the women’s draw saw Quebec’s Laurie St-Georges cruise to a 7-3 win in eight ends over New Brunswick’s Justine Comeau in a rematch of last year’s semifinal. St-Georges, who lost the 2018 championship game to Nova Scotia’s Kaitlyn Jones, had steals of two in the third and sixth ends one her way to the victory. Draw 2 Matchups – 2 p.m.